From the kitchen of One Perfect Bite...This is a lovely dessert. It's easy, delicious and different enough to be interesting. While the cakes are patterned after the perennially popular lava cakes, their true parent is a wonderful dessert developed by Anna Ginsberg. Anna called her dessert Extreme Peanut Butter Molten Lava Cake. Her recipe and photographed instructions can be found here. I've altered it slightly and while my version contains peanut butter, its predominant flavor is butterscotch. When perfectly executed, the center of the cakes will look like caramel and run like a slowly moving lava flow. If the cakes are over-baked they will be moist and have wonderful flavor, but they won't run and there's not much point in making lava-free lava cakes. You'll notice that the recipe calls for an egg substitute. While it may be overkill, these cakes don't bake long enough to destroy any salmonella that might be lurking in your eggs. Raw eggs can, of course, be used but not if you're feeding the very young, the very old or someone with a compromised immune system. These should be baked just before you plan to serve them. They are lovely with a bit of ice cream or a dollop of whipped cream. I know those of you who try the butterscotch mounds will love them. They are perfectly sized and are a wonderful way to end a meal. Here's the recipe. 1) Preheat oven to 450 degrees F. Rub insides of 6 jumbo (1-cup) muffin cups thoroughly with butter. Reserve remaining 7 tablespoons butter. 2) Mix cinnamon and 2 tablespoons of sugar in a small bowl. Sprinkle cinnamon-sugar evenly into buttered muffin tins and shake back and forth, tilting slightly, so that sugar coats bottom and sides. Turn pan upside down and shake off excess cinnamon-sugar. 3) Stir together peanut butter, butterscotch chips and reserved 7 tablespoons butter in a microwave-safe mixing bowl. Microwave on HIGH for 1 minute to melt; stir until smooth and creamy. 4) Combine reserved 6 tablespoons of sugar and egg in a separate bowl. Stir, do not beat, egg mixture into butterscotch mixture. Add flour and stir until smooth. Using a 1/3 cup measuring cup, scoop batter into sugared muffin cups. 5) Bake for 7-9 minutes or until tops appear just-set. Do not overcook. Some lava may peak through the top – this is okay. Remove from oven. 6) Hold a flat cookie sheet firmly over muffin pan and grasping both cookie sheet and muffin pan, invert muffin pan so that cakes come out on tray. Sift confectioners’ lightly over lava cakes. Carefully transfer each lava cake to a dessert plate. Place a scoop of ice cream and a sprig of mint on each plate. Serve immediately. Yield: 6 servings. Love the oozing butterscotch! Yum! Oh my, these cakes look absolutely divine. I love butterscotch and this I will make very soon. Goodness, gracious, Mary! How beautiful is that?? These look amazing! Can't wait to try them. Yum,Yum... such an irrestible wonderful dessert..
Mary, These look so unusual, and delicious. I've made and eaten many versions of molten chocolate cakes, but never butterscotch or peanut butter. Can't wait to try these. Thanks for your kind comments about my blog. You made my day! I like the name lava cake! Interesting what you say about eggs, we are so used to eat raw eggs, young and old alike (people,not eggs! ), I think that choosing local free range is the best bet against salmonella. The problem today is that people take cheap eggs for granted, and eat too many. Eggs should be eaten in moderation, and considered like a precious food. Battery eggs should be avoided altogether, yet there are people who eat them for breakfast, lunch and dinner, either by themselves or "hidden" in other dishes/food. Sorry Mary... went on a bit here, when I start I cannot stop talking!!!! Oh my goodness! I want these now! wow wow wow. i'm totally bought over by the oozing lava cakes mary! Wow! This looks wonderful! Nothing could be better than that oozing butterscotch! Oh these look so dangerously delicious! My oh my! Developed by Anna and endorsed by you, enough said, they must be delicious! I always thought that lava cakes only apply to chocolate. The butterscotch looks so oozy and divine. Great job, Mary. Have a nice weekend! OH YUMMYYYYY....love this cakes! Thank you for the recipe. Mary, these look so delicious. I'm a fan of molten chocolate lava cake and I believe I would love these too! Hugs! Lava cakes never failed to have me drooling....yummy! These look absolutely amazing. I've never seen a butterscotch version of this dessert before. Raw eggs in desserts generally don't bother me, but I never want to serve people something that could potentially get them sick, so I've started buying pasteurized shell eggs. A little more expensive, but worth the peace of mind! Oh this looks great!!! All we see around here is the chocolate, which I don't care for, it's too dark and doesn't really have much flavor either. These look intense and delicate, a more adult version of the chocolate ones. oh, look at that oozing butterscotch. love this kind of dessert. cake on the outside and oozing deliciousness inside. My daughter and I just ooohed and aaahed over this one! Ha! I'm not that familiar with the consistency of molten lava, but am willing to take your word that this is a good thing!! Oh wow this looks soooo good. Very original idea. Don't think I've ever seen a butterscotch lava cake. Great idea! Ana What delicious cookies, I'll try them here at home see what they say my children and my husband! This is an excellent twist to the chocolate lava cake. WOW!! !I likeyour version of these lava cakes....Love the butterscotch running out the cake . I always think of chocolate lava cake but not butterscotch, sounds fab! Have a great weekend Mary. The only thing I can say is that I want this now. Wow, Mary! These look amazing! Wow oh wow. Butterscotch is one of my favorite flavors. Where have I been not knowing one could create this version of the classic chocolate? Fantastic idea. Mary, these are a marvelous twist on lava cakes...I really must try this version! wowwwwwwww these mini-cakes look absolutely gorgeous! Have a nice day Mary! When we were kids we would walk down to Dairy Queen and I would always get a butterscotch sundae..never wavered. Butterscotch is still my favourite today if I allow myself sweet treats. Mary, you're killing me...but in a good way! These look amazing. Creamy sweet dessert, i like! wow this sounds and looks So delicious! you make the best stuff! Oh, my, I've never even thought of any other variation of molten lava cakes! Fabulous idea...I'm copying this one~thanks, Mary! 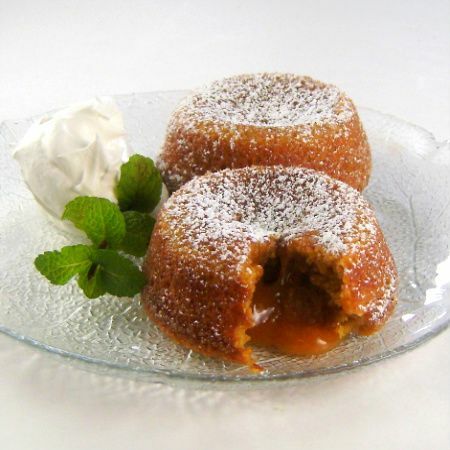 I love the idea of a butterscotch lava cake! Such a great variation. Perfect bite indeed! Looks amazing and really delicious! We make a mean chocolate lava ... never tried butterscotch. Didja know ... there never was any scotch whiskey in butterscotch. The "scotch" part came from the same root as "scorch." Browned butter and sugar. Mmmm...looks pretty and tempting. I had my first lava cake in Hong Kong. It was totally fabulous! I must try to make one day. Hope you have a wonderful weekend. Very different...have never seen a butterscotch molten lave cake recipe. It looks delicious! Looks and sounds so yummy....love your blog! I see a lot of things I want to make from your blog. Thanks for visiting mine as well. Oh these truly sound heavenly. I love lava cakes as is, but add in a butterscotch PB sauce...and it's truly ideal. Gorgeous, Mary. I'd like it way better than the chocolate! Thank you for this recipe Mary; my husband adores butterscoth, so these will be a great treat! Oh boy, do those look good. I love butterscotch, so these definitely need to go into my "to bake" file. Worth having a tea just to serve these cakes. Yummy! This is a discovery for me--I'd never imagined a butterscotch lava cake with peanut butter. Definitely a must-try! Oh my heaven!!! These look fantastic Mary!! Oh boy, this picture is sensational! I'm imagining how wonderfully decadent this butterscotch lava cake is with the oozing center. This is inspired. I've never seen any but chocolate lava cakes. I think I'd like both the peanut butter and the butterscotch. Mary...I am inspired to make this for my Piggies :) yummy! This is pure inspiration. Who could even imagine peanut butter and butterscotch as a molten cake. You present it beautifully, Mary. Thanks. I do love butterscotch and these look Divine! Leave the porch light on -- I'll be right over with my fork. :) Yet another amazing recipe, Mary. Thank you for sharing. I have never attempted a molten lava cake before. I love the butterscotch oozing out of it, looks divine! Mary, Thank you so much for the kind words about my blog: Lark's Country Heart. I hope you drop in and visit often. I cant wait to get time to read through your blog more...LOVE what I have seen so far. Love these and I can only imagine how fabulous they taste! They look amazing and I can't wait to try them! Thanks for the great recipe! These look so beautiful. The photo just makes me want to make them. I love the change from chocolate to butterscoth - in fact I have forgotten how much I love that flavor. The cake just reminded me. Oh my gosh. I've seen the chocolate versions, but I am not a big chocolate person. This is perfect. Butterscotch is right up my alley! This is definitely different, but you're right, it's the perfect switch up to a chocolate molten lava cake. Oh my Mary, my mouth is watering. I need a napkin. Slurp... Bookmarked this too. Can't wait to try it. Peanut butter in the batter?! Sounds fantastic! Can you imagine, I've never even tried a molten lava cake, not to mention made one? Thanks for making a butterscotch version! My husband would love these. These sound wonderful and I would like to make them for my boyfriend's birthday, but I have a question for you first - can this batter be made ahead of time, chilled in the fridge and then baked the next day? Thank you so very much!